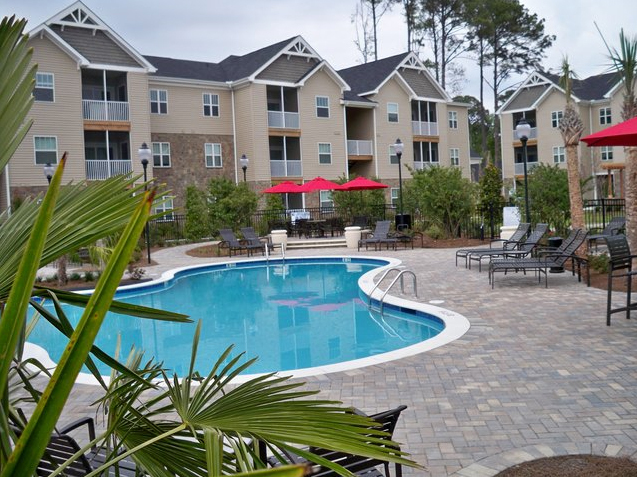 Ashton Pointe Apartment Homes offers spacious 1 and 2 bedroom apartments in Beaufort, SC. Our Beaufort apartments come with a fully equipped kitchen, full size washer and dryer, walk-in closets and screened in porch. We feature a sparkling swimming pool, fitness center, BBQ grills, and Internet Cafe. These apartments in Beaufort, SC offer comfort, beauty, and inspired living unmatched at any other apartment rental community in the Beaufort area. Situated in a gorgeous setting, Ashton Pointe offers spacious one and two bedroom apartments with abundant light, fully equipped kitchens, full sized washers/dryers included, screened-in porches, generous 9 ft ceilings and spacious walk-in closets. This community features an invigorating zero-entry swimming pool with BBQ grilling area, cutting edge fitness center, tanning salon, beautiful new resident amenity center with Internet cafe and an excellent location (conveniently located on Robert Smalls parkway). Living well is easy at Ashton Pointe. For more information, contact Ashton Pointe.